Margaret Sechler is a Licensed Clinical Social Worker with more than 25 years of clinical experience. Margaret promotes respect for those needing help with mood disorders, anxiety, self-esteem issues, social anxiety, relationship struggles and transitions, grief counseling and substance abuse. She also is able to help and educate family members and support persons who are experiencing these difficulties with others in their lives. Margaret’s unique skill is to provide a positive therapeutic relationship in which she and the client integrate insights to change negative thinking patterns and negative behaviors to more effective ways of living. 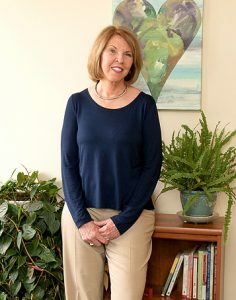 Margaret utilizes research-based skills, including Cognitive Behavioral Therapy, Motivational Interviewing, and Relaxation and Mindfulness Skills to enhance the counseling process. Margaret provides individual therapy, couples counseling and group therapy in her work with clients ranging in age from late adolescence through adulthood and into senior years. Margaret received her Master’s degree in Social Work from the University of Pittsburgh. She enjoys pursuing knowledge in psychotherapy, always knowing that she learns the most from the people she is working with, and she maintains an admirable level of enthusiasm for her work with clients. It has been a personal goal of Margaret’s to de-stigmatize mental illness and substance abuse disorders. An all-time favorite comment was, “Margaret taught me that I could manage having depression and have self-esteem”.